You know what we haven't had in this series? Donks! Oakland, just across a narrow estuary from Alameda, has a fair number of donkified GM cars, but the trend seems to be dying out. In any case, donkmania never got very big in Alameda, where old-school musclecars and lowriders seem to be the customization themes of choice. Here's a rare Alameda donk, which I shot next to Alameda High over the winter (no, it doesn't rain here in June). The car parked on that block every school day, so is it a teacher's car or a student's? Not sure if a student could afford 24s, but how many teachers would slap sparkly "24" emblems on the pillars? The '69 Continental that parks just down the block could well be a student car, though it's summer vacation now and the Lincoln is still there. 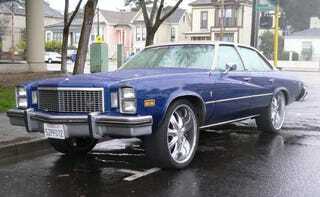 As we know, most Jalopniks prefer a dekotora to a donk, but there's no need to get all riled up over a '76 Regal 4-door with 24s if you don't groove on the donk thing; wheels can be replaced. In '76, the Regal came standard with a 140-horse 350 engine. Since 1976 cars are not smog-exempt in California (1975 and earlier cars are exempt from emissions tests), that's most likely the engine that's hauling this car's vast bulk these days (though a 455 could probably be swapped in, as long as it looks like a 350 to the smog techs and passes the tailpipe gas test).